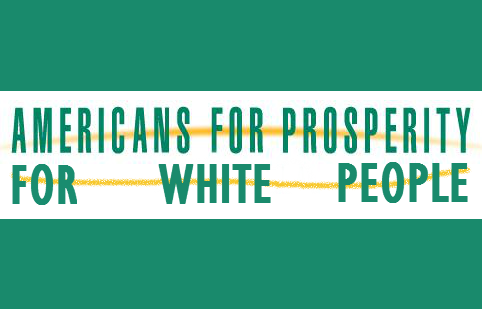 Washington – The conservative political advocacy group Americans For Prosperity announced they were adding “For White People” to their name, making the group’s complete name, Americans for Prosperity for White People. The group, formed in 2004, is backed by billionaire brothers, David H. Koch and Charles Koch, and has spent hundreds of millions of dollars on advertising and publicity campaigns in an effort to influence local and national elections and further conservative causes. Tim Phillips serves as the group’s president. Repealing the Affordable Care Act has been a central object of the group’s advocacy efforts. They sponsored a 2009 “Hands Off My Healthcare Tour,” where they warned of a government takeover of the health care system. The group favors a free market approach, because, of course they do. Other groups changing their names include White People’s Heritage Foundation and U.S. Chamber of White People’s Commerce.